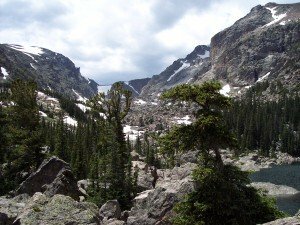 Within Rocky Mountain National Park, you'll find what I consider to be the greatest variety of hiking trails in Colorado. You can hike to lakes, waterfalls, through autumn color and lots more. You always have a good chance of seeing wildlife here, especially elk. Other residents of the park include mule deer, bighorn sheep, moose, mountain lions, black bears, coyotes, foxes, and marmots among others. Before heading into the national park, you might be interested in checking out one of the four visitor centers. Two of them are open all year and these are: Beaver Meadows Visitor Center, (Estes Park side of the park), and the Kawuneeche Visitor Center, on the Grand Lake side of the park. For more information about them, go here. The Beaver Meadows visitor center is located on Hwy. 36, just outside the entrance to Rocky Mountain National Park. It's only about three miles from the town of Estes Park. If you're going into the park from the town of Grand Lake, you can stop in at the Kawuneeche visitor center. You'll find it at about one mile north of Grand Lake on Hwy. 34 just outside the park. To start you in the right direction, here's how you get to Rocky Mountain National Park from the town of Estes Park: follow E. Elkhorn Ave. (U.S. Hwy. 36), to Moraine Ave. Turn left on Moraine Ave. and follow Hwy. 36 west all the way to the park. Or, you can go this way instead: from the intersection of Hwy. 36 and Hwy. 34 in Estes Park, take Hwy. 34 west, (Fall River Rd. ), and follow it all the way to the park. So, are you ready for a hike? If you are, click here to see my collection of Rocky Mountain National Park trails. These are all waterfall hikes. After you've seen a few of them, please let us know here, which one you think is the best. You can also go here to see what other people think is the best one. If you'd rather hike up to a lake, go here instead. As I mentioned in the first paragraph, you always have a good chance of seeing wildlife in this park. So I'll start adding pictures of some of the animals that you might see, along with a short description of where I saw them. 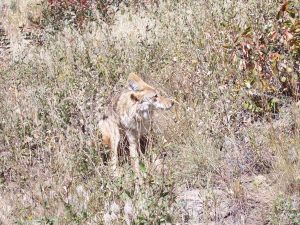 We spotted this coyote along the road to Bear Lake. He was actually with a couple of other coyotes and they were eating berries from the bushes next to the road. As you see here, they can partially blend in with their surroundings, so do keep an eye out for them. This bighorn sheep was with a small herd of sheep a short ways outside the Fall River entrance of Rocky Mountain National Park. 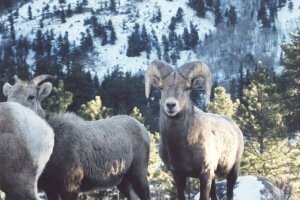 The best place to look for them is usually anyplace from the Sheep Lakes area, (inside the park), to McGregor Mountain Lodge, (outside the park), and beyond, along Fall River Road. Elk are the most common animals that you will see in Rocky Mountain National Park. They can be seen almost anywhere in the park but you're more likely to see them in the Moraine Park area of the park, especially during the fall. We saw this one near the Horseshoe Park area of the park. 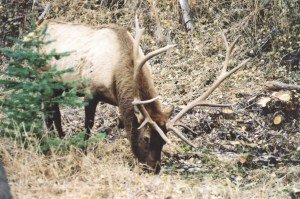 If you're looking to see bull elk, the best time of year to find them is during the fall rutting season. That's when they challenge each other for the female elk. 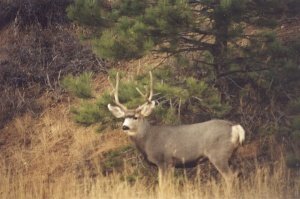 Although you might see mule deer in Rocky Mountain National Park, they are less commonly seen here than elk. We spotted this one outside the park along Fall River Road, not far from the park entrance. I've heard that one of the better places to look for them is on Deer Mountain. I haven't yet hiked that trail but when I do, I'll let you know whether or not I found any deer along the way. 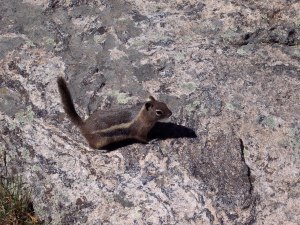 Ground squirrels are commonly seen throughout the park during the warm months. We saw this one near Mills Lake. He came right up to me looking for a handout, but it's best not to feed them. Other places in the park that I've seen these little critters include: along the Fern Lake trail, along the trail to Alberta Falls, and along the trail to Nymph, Dream, and Emerald Lakes. Would you like to see more pictures from the park? If so, please visit my Rocky Mountain pictures page. And if you'd like to see even more pictures from the park, including a short video taken along Trail Ridge Road, see this page of Rocky Mountain National Park highlights. The above link will take you to another website which features pictures and videos from various parts of Colorado. Enjoy your visit :-). Return from Rocky Mountain National Park to Colorado Hiking Vacations home page.